Were things really cheaper then? 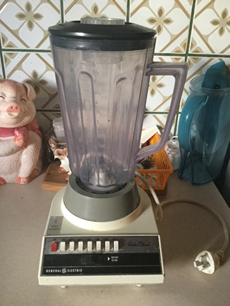 Recently, I looked at buying a blender but I was surprised to discover that the average rickety looking unit costs over $100. The old G.E. blender may be noisy but at least it is solid and still works. Totally false advertising – despite its seven settings, including ‘Chop’, ‘Mix’ and ‘Aerate’, it basically has one function, which is to pulverise everything! 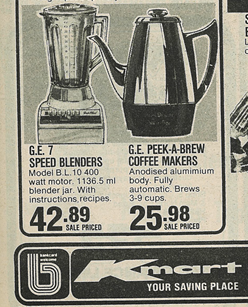 When we entered the cost of the blender into dollartimes.com we discovered that today you would need $174.31 to buy this appliance. No wonder Mum had to put it on layby. This entry was posted in history and tagged history by adrienne12. Bookmark the permalink.